Support Texas Rivers with this license plate! Texas has 191,000 miles of rivers and streams. These waters and their associated riparian ecosystems support a rich variety of plants and wildlife. They offer fine fishing and breathtaking scenery. Finding public access to rivers can be a challenge, however. Visit the links below to explore some options! Since the Texas Paddling Trails Program began in 1998, Texas Parks and Wildlife Department has partnered with local communities to expand public access in river basins around the state. More than 70 public paddling trails offer well-mapped day trips in a variety of settings. 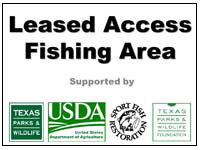 TPWD has signed temporary agreements with landowners to allow public fishing and boating access through private property. Leased access sites are available on the Brazos, Colorado, Guadalupe, Neches, and other rivers.